MASTER PROBLEMS People and Society What are the odds you will die from an asteroid? What are the odds you will die from an asteroid? Today, one of the most bizarre forecasts about the end of our planet involves a catastrophe caused by an asteroid or a comet. Such acronyms as NEOs (near-earth objects) and PHOs (potentially hazardous objects) are heard in connection with apocalyptic forecasts about the earth being destroyed by impacts with celestial bodies. Hollywood has rushed to translate these fears into box office profits with such movies as Deep Impact and Armageddon. Just what are the odds that you or your children will perish by a fireball from heaven? Should you expect a rain of chunks of iron and ice to bombard your backyard soon? If you live near a coastline, will your home be leveled by a huge tidal wave caused by a rogue asteroid plunging into the sea? Our solar system consists of much more than the sun, nine planets, and their moons. Comets (conglomerates of ice and dust), asteroids (small or minor planets), and meteoroids (mostly fragments of asteroids) are also orbiting within the solar system. Scientists have known for a long time that earth is subject to bombardment from space. We have only to look at the moon’s battered landscape to realize that we live in a cluttered neighborhood. Were it not for the atmosphere and the continuous recycling of earth’s surface by plate tectonics and erosion, our planet’s face would be as cratered as the moon’s. Scientists estimate that as many as 200 million meteors are visible in the earth’s atmosphere every day. Most of the objects that enter the atmosphere are small and burn up virtually unnoticed. Some of these objects, however, survive the fiery heat of entry and are slowed down by air friction to a speed of about 200 miles an hour [320 km]. What is left of them hits the ground as meteorites. Since most of them fall into oceans or uninhabited tracts of land, rarely have they caused harm to people. It is estimated that the objects that enter our atmosphere add hundreds of tons daily to the earth’s weight. Additionally, astronomers estimate that there may be about 2,000 asteroids larger than six tenths of a mile [1 km] in length that either cross or come close to the earth’s orbit. They have discovered and tracked only about 200 of them. Also, there are an estimated one million asteroids larger than 160 feet [50 m] across that come dangerously near earth’s orbit. Asteroids of that size can reach the ground and cause damage. Such a comparatively small projectile packs about ten megatons of energy—equal to a large nuclear bomb. While earth’s atmosphere can protect us from smaller impacts, it cannot stop those with ten megatons or more of energy. Some researchers claim that, statistically speaking, we can expect a ten-megaton impact about once a century on an average. According to some estimates, the impact frequency of objects close to a mile across is once in 100,000 years. It is not difficult to believe that our planet has been hit by large objects raining down from space in the past. Proof of these impacts can be found in the more than 150 discovered craters that pockmark earth’s surface. Some of them are clearly visible, others can be seen only from aircraft or satellites, and still others have long been buried or are on the ocean floor. One of the most famous of these craters, known as Chicxulub, produced a scar on earth’s surface 110 miles [180 km] in diameter. Located near the northern tip of Mexico’s Yucatán Peninsula, this huge crater is believed to be the impact site of a six-mile [10 km]-wide comet or asteroid. Some claim that the climate changes triggered by this impact caused the extinction of the dinosaurs and of other land and sea animals. In Arizona, U.S.A., an iron meteorite gouged out the spectacular Meteor Crater—a hole nearly 4,000 feet [1,200 m] across and 600 feet [200 m] deep. What would the casualties be if a meteorite like that hit a city? A popular display at the American Museum of Natural History, in New York City, shows that if such an object were to hit Manhattan, that crowded borough would be completely destroyed. On June 30, 1908, an asteroid or a chunk of a comet estimated to be less than 300 feet [100 m] across roared into the atmosphere and exploded some five miles [10 km] above the largely unpopulated Tunguska region of Siberia, as mentioned in the introduction. The blast, estimated at 15 megatons, devastated an area of 800 square miles [2,000 sq km], knocking down trees, starting fires, and killing reindeer. How many people would have died if ground zero of that explosion had been a densely populated area? In July 1994, telescopes all over the world focused on Jupiter as fragments of the comet Shoemaker-Levy 9 crashed into that planet. The temporary scars formed on Jupiter will remain deeply engraved on the minds of those who saw the collisions firsthand. Watching Jupiter suffer hit after hit left experts and laypersons alike wondering what would happen if, instead, the earth had been the target of the comet. 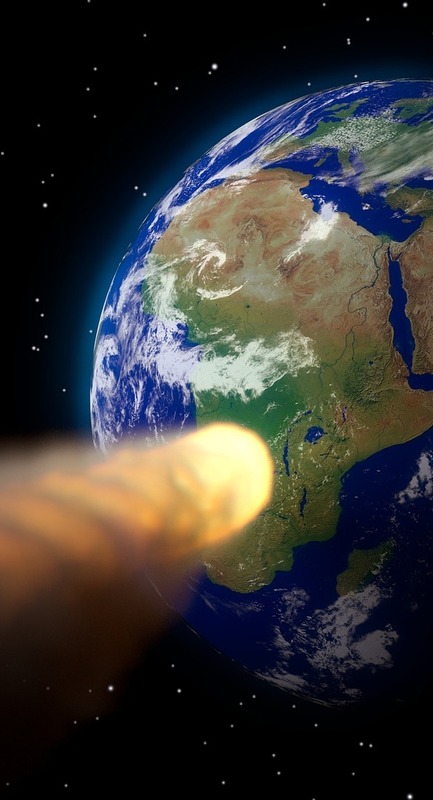 What would happen if an asteroid or comet hits the earth? With trepidation, scientists have considered the dire consequences that a comet or asteroid impact would have on our planet. This is how they envision the immediate results of a major collision. First would come an explosive plume of rock and dust. The falling debris would produce a meteor shower that would turn the sky red-hot and ignite forests and grasslands, killing most land life. Dust remaining suspended in the atmosphere for a longer period would block sunlight, causing temperatures to plummet and halting photosynthesis on the darkened surface below. Suppression of photosynthesis would also lead to a breakdown in the oceanic food chain, condemning to death most marine creatures. According to this scenario, the environmental disaster would be rounded out by global acid rain and the destruction of the ozone layer. Were such an asteroid to hit the ocean, it would produce tidal waves, tsunamis, with tremendous potential for destruction. Tsunamis would travel much farther from the impact site than the initial shock wave and would produce widespread destruction in coastal areas thousands of miles away. However, one must be careful about such assertions. Much of this theorizing is mere speculation. Obviously, nobody has seen or studied an asteroid colliding with the earth. Also, today’s hype-crazy media are quick to come up with sensational headlines, based on incomplete or even inaccurate information. Actually, it is said that the chance of being killed by an object falling from the sky is significantly less than the chance of being killed in a car accident. Many experts believe that the best strategy for avoiding disaster by an approaching comet or asteroid would be to launch a rocket to intercept the invader and, at least, change its course. If the asteroid is small and is detected many years before its calculated impact, this blow might be sufficient. However, for a larger object that might collide with the earth, some scientists propose the use of nuclear weapons. In such a case, it is believed that a carefully placed nuclear blast would nudge the asteroid into a safer orbit, turning a hit into a miss. The size of the asteroid and its proximity to the earth would determine the size of the nuclear explosion that would be needed. The problem is that none of these possible defensive measures can be effective without adequate advance warning. Such astronomy groups as Spacewatch and Near Earth Asteroid Tracking are exclusively dedicated to asteroid hunting. However, more needs to be done in this direction.